Offering idyllic homes in idyllic locations across Cornwall! 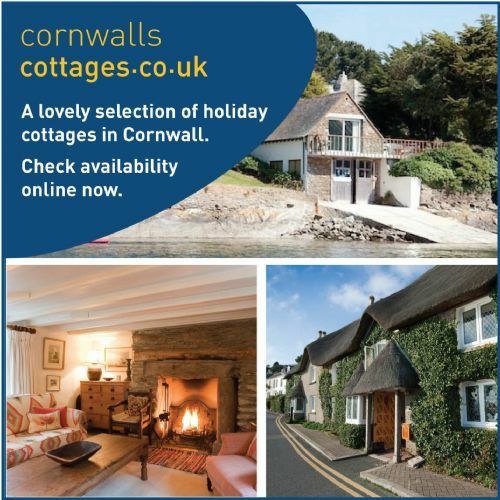 CornwallsCottages.co.uk has over 300 holiday cottages, apartments, barn conversions, homes and luxury houses to rent across the beautiful county of Cornwall. Visit our website where you can search for your perfect place to stay, see lots of photos, videos, floor plans and book online 24 hours a day. From the golden sands and rolling surf of the stunning Atlantic Coast to the charm of classic Cornish harbour villages to walking the breathtaking south west coastal path or enjoying a delicious seafood lunch or indulgent cream tea, there is something for everyone in Cornwall. Atlantic Cottage is one of the best properties I have ever rented. Very cosy and comfortable. Location is great for visiting the many attractions in this part of Cornwall. Wouldn't hesitate in recommending. I thoroughly enjoy my stay at St. Yse Cottage. It's a very comfortable place with lots of space to spread out and relax. The grounds are amazing to explore and blend seamlessly into the public paths and woodland overlooking St. Nectan's Glen and Waterfall. If you have a suitable vehicle for the rough track up to the remote cottage, then it's well worth it. Had a fabulous time. Lots of lovely touches when we arrived, including the food basket and delicious cream tea. Owners were very friendly and lovely to watch the animals being fed in the morning. A great environment and topped off with the present of some very tasty home baking when Fleur had made a cake. We booked this holiday earlier in the year, anticipating the completed finish of these converted barns. They have been done to such a high standard and the views from the open plan kitchen/ diner we’re amazing. Plenty of space for our dog to play, and only a short distance to mullion village. To finish off with a glass of bubbly in the hot tub was brilliant. If you are looking to escape and want a vacation that ticks all your boxes, then this is the place to go. Lovely place to stay in Cornwall. It was clean, lovely surroundings, and had everything you needed to provide a comfortable stay. As soon as we walked into the barns and saw the lovely decorations and festive gifts we knew we were welcomed. Having the 2 barns connected was ideal for our family to enjoy our Christmas celebrations. The play barn was a great addition to the setting. Me and my family have returned to this property for many years. We have searched the Internet for other places to stay but always come back here. The Linney is home from home, has everything you would need to make your holiday great I would say and more! Lara who is the housekeeper always keeps it immaculate,plenty of wood supplied for the fire, fully prepared for your dog pls a nice bottle of wine, milk and flowers. Central for many lovely beaches and pubs. I could go on and on but will stop or won't be able to get in later this year or early next. Stephen Davey Barn is set in the grounds of Bochym Manor, a beautiful setting. The barn is clean, well furnished and well looked after. There was ample space for the 8 of us. We thoroughly enjoyed our stay there and would happily return again. Excellent, relaxing place to stay. Owners very helpful and welcoming ( wine, milk, biscuits and flowers ) but leave you alone to enjoy the peace and tranquility. Beautiful walled garden with lovely views. Great position for both coasts. Second holiday there and would happily go again. Our 2nd visit to Hideaway, so peaceful and relaxing, and the accommodation is second to none! And, well the views!!! Overall brilliant. Lovely views - great location - perfect for the dog - brilliant pub - hope to be back again sometime. Perfect weeks holiday in a peaceful and quiet location. Jon and Sam are excellent hosts and a welcome pack on arrival is a lovely touch. The accommodation is superb and well placed to explore the north Cornwall coast or to just sit outside and take in the peaceful surroundings. Would highly recommend this property. Lovely house in quiet area. St Just is a pretty village. Bit too quiet for us. More to do at St Mawes close by which has some nice eating places. Great hosts and beautiful place ! Would recommend location for walking to coastal path and area for eating out in pubs. Although not right by the beach, the location of this house is great for various excursions around the Camel Estuary, and within easy walking distance of the centre of Wadebridge. We found the house was very clean, the beds comfortable and the owners were very attentive to any questions we had. We would certainly book this house again, we loved it! Beautifully presented accommodation to a very high standard. Designed for the best use of the space creating exceptional relaxation area and comfort. Exceedingly well equipped with well designed kitchen area and appliances. Thank you for the kind thought of providing the welcome pack. We look forward to seeing you again. A lovely peaceful holiday, great facilities and very dog friendly. Excellent hosts and a homemade cake to welcome you. We were very impressed with this sympathetic modern conversion of a historic building. Pretty much everything inside from radio to to kitchen utensils were not only new but good quality. The easy walk into Lostwithiel meant the car was not needed at night. On arrival we found the place extremely clean and very well fitted out. We loved Saint Mawes and greatly enjoyed watching the harbour activity through the windows. We did however find all the chairs in the lounge extremely uncomfortable to sit on and we both suffered from an aching back after a couple of days - so I would not recommend it to anyone who has back problems. With that one exception, everything else about the property was excellent and we certainly loved Saint Mawes and will return there again. Stayed as a family of 7 and were very pleased with the house and the location. Enjoyed garden space. Had a fabulous holiday. The barn was of a very high standard, well equipped and had plenty of space. It felt like home from home, there were plenty of things for everyone (pool table, hot tub, swings, board games) and a small library of book swaps. With two master bedrooms with ensuite it was perfect for two families. The owners were very welcoming, baking rock buns for our arrival, and also very accommodating in storing our bikes. The location was convenient for both Cornwall and Devon and there was certainly plenty to see and do. We would definitely stay again. What a fantastic place!!! A fully furnished, clean and homely bungalow...the photos on the website do not do it justice!!! Everything we could need was provided and the cream tea left for us was very much appreciated!! Bev and John the lovely owners were on hand and gave us recommendations for days out and a local gem for an amazing breakfast!! I would definitely recommend The Brook...we'll definitely be back!!! After careful review and having booked properties in previous years with Cornwalls Cottages, I thought i would try a new one this year. I was not disappointed ! Chapel Cottage although small was immaculately presented, very cosy and with a great view of St Mawes waters. Cannot find fault, only small things..no microwave and TV was a bit small but that's being 'picky' i think ! Will book again and well done Cornwall Cottages again. Superbly equipped, everything we needed, warm and cosy and very friendly hosts. We'll be going back next year! Great accommodation, friendly welcome. Would definitely recommend to family and friends. Ideal base for travel around Cornwall. This property was a wonderful treat for New Years, perfect for families, spacious, well equipped, beautifully clean and well situated for lovely coastal walks within half an hour. A beautiful bungalow. Well equipped with comfortable beds stunning views and a superb location. A wonderful week in cornwall and highly recommended. Great location, very welcoming and spacious accommodation, great view and we would highly recommend and we will return in the future. My puppy, boyfriend and I stayed here for 5 nights. It was absolutely lovely. Everything we needed was there! Dolly and David made us feel very welcomed and answered any questions we could’ve had! The views are just amazing. The only small detail that let it down was there was no curtain above the front door. Which meant that anyone that walked past could see into the house and see us upstairs in the living room. Therefore you don’t get 100% privacy. Apart from that, I couldn’t fault the place or the owners! Lovely place to get away and get muddy with your doggie :). Thank you! This is a delightful cottage with enough kitchen utensils to make a full meal. Lovely log fire to sit by of an evening after enjoying the fab games room. There is pool, futsball and table tennis which was so much fun after a day of sight seeing and before dinner. My boys were very happy that Netflix’s is installed in the TV! Highly recommend for a family with older children (mine are 8 & 11) and lots to do exploring the fields around the cottage and further a field. Would definitely come back. Absolutely perfect in every way, the owners were lovely, very informative and nothing was too much trouble. Even Duke (the dog) was brilliant. We thoroughly enjoyed our stay at Ardevora an Gylen. The accommodation was excellent and proved to be a very good base from which to explore The Roseland Peninsula. We were given a very warm welcome by Teri, who also provided us with a welcome pack. This was our second stay at Headland Studio Bude. Despite the cold and stormy weather, the studio was well-heated and cosy. Although small, the studio has everything you need for and is perfectly placed for popping into Bude, either by car or a quick walk along the coastal path to admire the scenery which is stunning whatever the weather. We love it here and hope to be back before too long. We have stayed in this lovely studio on Loe Beach twice, and each time have found it a perfect little place for two people. It has been very tastefully decorated with subtle colours, and has interesting pictures and other artefacts to give a nice touch of homeliness. The kitchen is well equipped and the bathroom very comfortable. Plenty of hot water always at your disposal. The view from the studio is very beautiful and it is a very peaceful place to stay. This is the first time we have stayed in Cornwall in any accommodation other than a touring caravan and we loved it Plenty of room for 5 adults and the dog. We were made to feel very welcome and cannot fault the wonderful barn conversion with all amenities included. You will need a car as you do have to travel around 3 to 4 miles to the nearest shop or pub, but driving around Cornwall is all part of the enjoyment in seeing what this beautiful place has to offer. We really enjoyed our stay at the Shippon, Rita was very accommodating and put up a surprise 50th birthday banner for my wife on arrival. The home made scones were lovely as well. Would definitely recommend. The area is a lovely place to stay for a holiday. A beautiful countryside where you can walk, do water sports or visit typical fishing villages. The Riverside Cottage terrace faces a tiny little dead end where cars usually turn around or people walk by. You can nicely make contact there or you choose one of the other nice cottages nearby. Situated in a very quiet lane, this cottage was a home from home experience. A wonderful garden too. Close to amenities. Two pubs within walking distance. Also a well stocked local shop just a mile away. Lots of wonderful walks. A very clean and comfortable place with a great woodburner. Our dog was very settled there but the only downside was that we weren’t permitted to leave him in the cottage unattended (though I understand why). Definitely will be returning. Last minute booking, which was hassle free. Well presented spacious house, very comfortable, and well equipped. Bonus having a car parking space at the rear, but it is very tight, so more suited to a smaller car. Appreciated the welcome gifts. House was a stones throw from the quay, but be prepared for steep steps. St Mawes was a lovely location, pretty, and friendly people. Would very much recommend a visit. In all, loved our stay, and would return. Very enjoyable week. Excellent place to stay in Cornwall, one minor gripe as advertised as having WI-FI but it did not. I would still recommend for anyone to stay, a nice welcome and it is quiet and secluded with lovely views over the countryside. Absolutly amazing time staying at the Poppy Yurt; everything you could have possibly needed was included; such as an umbrella, torch, even a corkscrew. Heated swimming pool was an added bonus. Highly recommend this property. Really lovely old cottage with beautiful gardens. Spotlessly clean with everything a family needs for a stay away. Great location, charming owners. Lovely local pubs with great food. Definitely worth a visit. This is the second time we have stayed at Upper Tresulian and we hope to stay many more times. The only disappointment is they are booked all summer long! The location cannot be bettered, the apartment is comfortable and practical with stunning views, quiet but only yards away from the centre of St Mawes. Hosts Paula and Leslie feel more like old friends and very approachable for local information and help, not forgetting 'Alfie and Buddy' their wonderful dogs who greet you as long lost friends. A comfortable, well equipped house house in a great location. Having stayed in a few in the same area, this is my favourite. Upstairs view is fantastic. Front and rear gardens well designed to capture the sun even in March, but we did strike lucky with the weather which helped. Already pencilled in for next year. We stayed at the Piggery in July 2018 for a week and found it to be very enjoyable and comfortable. The cream tea (my first ever) was a very pleasant surprise, as well as the treats left out for our Beagle. The Piggery provides every comfort you need for a week exploring Cornwall and its location is ideal, as we pingponged across the county. We did not make use of the hottub (we have one at home), nor did we use the games room, but had we stayed longer, we certainly would have done so. The bed was comfortable, all was very clean and there's only good feedback from us. A lovely stay! We have stayed at Primrose Hill a number of times and look forward to each stay. Cornwalls Cottages are a friendly team and make each booking very easy. The location of the property is ideal and also it's size and home comforts make our holidays totally relaxing. Another important part of our holiday at Primrose Hill is the Housekeeping by Julie Kemp and her team. She is always accessible if needs be and also the house is a pleasure to walk in to as we know it will always be immaculate. We shall be returning again in June this year. We love Chy An Mor, I think this has been our 5th visit. The location is second to none (sunny all day, when it's out) benefit of a parking spot is so useful. Porthleven is our favourite place in Cornwall so we do like to visit regularly Weather was "dire" for our recent stay, but made no difference to our enjoyment of Chy An Mor! A really lovely cottage. Well presented, very comfortable and exceptionally well equipped. Ideal for a family holiday, near wonderful beaches and lovely areas for walking. We had a thoroughly enjoyable few days. Had a fantastic stay in Mermaid Cottage, exactly what we wanted. However double beds need to be king size with new mattresses and more comfortable sofa. Reclining chairs become very uncomfortable very quickly. Loved the hot tub. Would definitely recommend these cottages. See above plus feeding animals-my grand daughter loved it was superb. Owners were brilliant and their advice on where to go was second to none! Another wonderful stay at beautiful Penjerrick - peace & quiet in picturesque surroundings with just the birds and boats as our neighbours. A true slice of heaven & we’re sure to return to our favourite cottage. Thank you. A great welcome complete with cream tea and wine as well as a tour of the premises enabled us to settle in easily and quickly. Essential information and advice was given when required ensuring that we felt comfortable in talking to our hosts and learning from them. All in all an excellent stay in a delightful location. This is our second stay at the cottage, we really like this place. They have done the cottage up over the winter and the changes have much improved the cottage. It's a fantastic place with a lovely kitchen and great bedrooms and the garden is great too! Second stay at Holly Cottage and we enjoyed our visit as much as the first time. The location is so beautiful and serene that we slowed down and relaxed as soon as we arrived. Holly Cottage is comfortable and met all of our needs,any requests were quickly resolved by Lucy and her team. Think the chance of a repeat stay is high, thank you to Lucy and her staff. Found the cottage to be perfect for the two of us, everything we wanted or needed was there as well as being in a great location, found everything to be very clean and everything to make a very pleasant stay well thought out. We stayed during what some may consider the ‘off’ season and although some of the larger ‘attractions, were closed we found what we regarded as the real Cornwall and its people a wonderful place and would recommend going early in the year to beat the crowds so to speak. We had a lovely stay at the Bolthole and would recommend to everyone. Such a lovely place to call home for a week, a comfortable and cosy place to stay and a great location to explore Cornwall. Made to feel very welcome by the owners and the welcome pack helped greatly too. Stunning location.Even the extreme weather could not dampen the vista.Peaceful, relaxing and comfortable . Would recommend to anyone and plan on revisiting. Our stay was extremely comfortable, with a fab log burner which we needed for our week in November! We had the offer of a cream tea when we got there and a welcome bottle of wine and eggs from the owner chickens. Highly recommend this cottage. Warm, comfortable accommodation. Well equipped. Lovely view from the double bedroom, which had a comfortable king size bed. Good shower in en suite. Friendly helpful owners. A delightful friendly place to stay, extremely convenient for local friendly pub and very good for our four legged friend. This was a lovely cottage and we were so comfortable. It was exactly what we needed. Warm cottage & comfy beds. The booking process was straightforward and communication from both Cornwalls Cottages and John & Jill, the hosts, was excellent. We would love to come back and spend longer. Great cottage with all we needed. Was meeting family and friends for a birthday occasion, location perfect. We thoroughly enjoyed our 2 weeks at the cottage. Within 5 miles (as the crow flies!) there is plenty we can see and enjoy: beaches in small coves, foot paths along the coast and inland, picturesque villages and churches, historic buildings... We cannot not mention the welcome, friendliness and helpfulness of Judy and Steve. Well located (once you get used to the lanes of Cornwall! ), well appointed & comfortable home. No issues & no hesitation in returning or recommending. Gorgeous, cosy and well equipped. Lots of steps, so not great for small children or elderly or disabled. Bit noisy in the mornings with bottle emptying from pub and cars and bus outside. Apart from that, it’s jus a lovely cottage, with a lot of thought and love and in a lovely village. The pub is a great addition opposite (despite the bin emptying noise) and I would definitely stay again if I was in the area. The treasure box has everything you need for your stay it’s clean and comfortable set in the heart of mullion village. We recently had two weeks perfect holiday at Barton Cottage in the most beautiful and peaceful situation just a ten minute drive from the nearest beach Crackington Haven or a 30 minute walk along the coast path down to the beach. The cottage is a very comfy character home with everything you need for a lovely holiday. The surrounding area is stunning fabulous beaches for surfing and swimming and dog walking and beautiful coastal walks. Hopefully we will be back with our dog for another lovely holiday next year. The accommodation exceeded our expectation,We were very happy with it. The place was well equipped,comfortable , clean &c.
Beautiful, clean bungalow, great surroundings!! Staff Very helpful on site!! Would definitely recommend! Lovely property, well equipped from cafetière to cooking foil, soap and spare batteries, and in a handy location. We loved staying at the threshing barn. It was everything we hoped for as a 3 generation family plus dog! Great location very warm welcome from owners and beautiful clean and comfortable barn. Would love to return. Thank you. I really enjoyed my stay at Barolo. It's very central, just behind the pier. The apartment was clean, comfortable and well looked after. Service from the owners was perfect, and the welcome bottle of wine was a nice gift. Best of all, Barolo comes with a parking permit for the pier, which is worth its weight in gold - there's almost a direct line from the car park to the front door. We loved staying in this property! It is well furnished with stylish, contemporary decor and a very well equipped kitchen. The location is great - very central with an easy walk (if you don't mind steep hills!) to beaches, shops, restaurants, ferry and harbour. We had a fantastic short break here the cottage was quirky full of character and very clean with two gardens ideal for our dogs own private off road parking and a short walk to the beach loved it. Everything was very nice only criticism the road in a bit of a letdown.but we would consider it again. A comfortable compact cottage in a great location. Had an absolutely wonderful week in the Mill House (4/8/18-11/8/18), with all my family, grandchildren & our puppy. Couldn't fault the place, fun for all the family. Excellent accommodation & location with lots of extras that you don't normally get with self catering, e.g.ample loo rolls, kitchen rolls, tea, coffee, milk, even dog biscuits & poop bags. Scones with jam & clotted cream were waiting on the table for us as well. If you're heading for Cornwall this is the place to stay. Thanks to Mark, Nikki & team. Hollowtree cottage is an excellent place to stay it is located in a quiet area with good access to the surrounding areas. I highly recommend Hollowtree cottage. Stunning location, excellent customer service, relaxing cottagelovely holiday, ideal for half term. Highly reccomended. We had an excellent stay at Trevadlock with our two young children. The hosts are warm and friendly, the accommodation superb and the setting is rural tranquility- just what we were after! We would love to visit again especially in better weather! A lovely property that was really well equipped. We thoroughly enjoyed our stay. The lodge was spacious and very comfortable. The location is perfect. However please note that the road leading to the cottage is gravel and quite tricky and also a very big SUV might not fit through the very last gate. The owners are very welcoming, helpful and reserved. The cottage is extremely clean and equipped with all you might need. Lovely garden too in case you want to use a small disposable BBQ. We had a wonderful and very comfortable stay so we recommend it fully. The studio is well set out, with everything a couple can need for the holiday. Even a coffee pod machine, so perfect. Thank you. The view is heavenly as a bonus. We'll definitely return. We stayed over Christmas and the cottage had been decorated to keep us in the festive spirit. The cottage is very well equipped, clean and comfortable. Highly recommended. Really lovely place to stay. Our 4th or 5th visit returning to the same block. Top floor is best for the better views! Good kitchen area, comfortable beds, good sofas and fab views. Just up off the main sea front so not too much of the bustle but everything St Mawes has to offer is just a stone's throw away. Highly recommended. We were delighted to find this property fulfilled our expectations. Well equipped and excellent presentation. We all had a lovely stay at the Fowey Retreat over the Christmas week. Plenty of places to visit nearby and lots of good walks nearby. You do need good weather to make good use of the lovely garden. The Owner was very welcoming and accommodating. A perfectly picturesque location where our day revolved around the comings and goings of the tide. We learned to paddle board here in these shallow waters, enjoying the sun on our faces and the wildlife for company. Lucy could not have done more to make us feel looked after and welcome and any problems were resolved promptly. The cottage was cosy, comfortable and perfectly equipped for a week away from home. We very much hope to return one day. As all the reviews say, this place is very tranquil and well off the beaten track (which is why we chose it). Whilst very comfortable some updating would benefit all future guests. No wi-fi was not a problem as we used our phones to email the outside world. Signal dropped off between 8am and 9am each morning, rest of the time there's a 3G/4G signal. Would we go again? Yes, most certainly. The house is an unusual design as a slice through the old chapel. It has unusual arched windows from the floors upstairs. We had a very comfortable 7 nights. There is a TV in each bedroom and downstairs. All the facilities worked well. It is very handy for the Eden project. We came from a different direction so our helpful map didn’t help us. We switched to our Sat Nav that led us down some beautifully fern lined single tracks. We were lost, we found the Jamaica Inn and rang our hosts who kindly came and got us. The stay was restful and all the fresh air helped us sleep. 10-15 minutes drive there is Bodmin town where there are quite a few supermarkets to get your supplies from. We had a lovely short stay at the Tractor Shed and hope to return. Nothing was too much trouble and the welcome cream tea and milk was very much appreciated and a nice personal touch. Went above & beyond what you would expect. You didn’t want for anything; everything you needed and more. Suitable for the whole family, including children & dogs! Would definitely recommend this accommodation. My 2 family's were very comfortable and they loved every minute of their stay at Sammyshute and would do all over again. The cottage is very clean and fresh and fitted to a high and practical standard. It has everything a party of 6 will need including 3 en-suite bedrooms which is a major bonus. If you are looking for peace and quite, the cottage ticks that box and you walk out of the front door and you can be on open moors in 20 yards. Probably the most relaxed I've been all year! Probably the best "rental " for a holiday that we have had , whatever the weather. I have known the Roseland area for over 40 years and will certainly consider this well equipped property for vacation in the future. Booked a last minute holiday and struggled to find a pet friendly location that wasn’t crazy prices for summer . Found Towan cottage and pet friendly so booked. Space very well laid out compact lounge/ kitchen but everything worked well. Great bathroom /shower and bedroom. Remote location but very peaceful and good views . About 10 mins drive to Praa sands and 15 mins to Porthleven( great choice of restaurants ) If you want a peaceful , good value for money escape for 2.. or 3 with dog ! and don’t mind the drive you can’t go wrong here. What lovely accommodation, and welcomed with scones, jam and cream. Fabulous location in Charlestown. We had a brilliant week at Sunlight cottage. The hosts were great, Close if you need them but didn’t intrude on our week in any way. The cottage itself had everything we needed as a family of four. We all slept really well as it’s so quiet and no street lights waking us up! Location wise, it’s was perfect for what we wanted. We visited a different beach every day and were happy to travel around a bit. We will definitely return if we are in the area again. Lovely cottage in a fantastic location. It was very warm and cosy. Conservatory/dining area in the kitchen had fantastic views over the sea. Lounge was very comfortable. The only criticisms are that the mattress and duvet on the double bed need replacing - they are a bit tired as are the tin opener and the potato peeler! Having said this we had a great time and would definitely stay in this cottage again. Really enjoyed the property this time as we stayed in the piggery last year and had a brilliant time. Will definitely be booking again as the location is fantastic for days out and big enough to relax at the property if you fancy. We had a lovely stay in an excellent equipped cottage. The garden is not massive but there is a very big green space just outside the back garden door. The kids loved playing chase there. Bude, Tintagel and Trebarwith Strand are just a Short drive and there are more lovely beaches around. We also had a nice walk (1h) to Crackington beach. We would love to come back. We had a great stay at Pennasville 18. Excellent location of an excellent cottage. Ocean and pub nearby. Everything you need to unwind, relax and enjoy Cornwall. Great location! Very convenient for visiting Cornwallprofessor north south and east costs. Great house, nice hosts. The Pottery provided me with a restful place to write and relax. It was ideal. The gardens are lovely and the area is so quiet! The owners were excellent- nothing was too much trouble for them. I will be back! Great location for a weekend break. Good cottage with everything you need. Could do with a second toilet with a house that can take up to 6 adults. Lovely and comfortable all round. A first class house that we have stayed in before. Plenty of room with drawing room, dining room, kitchen, utility room, two bathrooms, three bedrooms and a conservatory. A lovely location near St. Mawes and with nice beaches within walking distance, if up a steep hill. Also the house is very near The Royal Standard pub which is dog friendly and has a nice garden. Overall there is nothing you can say bad about this delightful house. Spotlessly clean, perfectly positioned, fully equipped & a wonderful personal welcome from the owner. Far exceeded my expectations. I'll be back! Lovely, immaculate cottage, ideal to get away from it all. Welcoming gifts of local produce were much appreciated. had a lovely stay at 'our cottage', it was very clean and well equipped. Loved the quirky features. Lovely location and beautiful scenery. Fantastic location in well presented,clean and comfortable accomadation. A few little niggles like lack of soap holder in shower, no spare toilet paper and a coin meter for electric. Luckily we ate out and didn't use the appliances, would imagine it could be expensive if fully occupied. All in all it ticked our boxes and we had a lovely holiday. The flat is convenient for shops, restaurants and hotels in St Mawes. Car parking is nearby. This was our second visit and we found it to be welcoming and comfortable. Another wonderful stay in Rose Cottage. It provides everything we and our dog need for a relaxing break. Perfect enclosed garden and a brilliant location, rich in coastal and moorland walks. Second visit to Romany Rye (third already booked). The position is wonderful, virtually on the beach. Very well equipped house that was cosy and warm in January. A cream tea on arrival was the finishing touch (thank you June). Counting down to our summer visit now. Just had lovely holiday at Gribbas Cottage. Its a lovely property and extremely well equipped with everything you could need. Lovely & clean & tidy ,& the milk & cookies on arrival were very welcome. Our Collie dog thoroughly enjoyed the walks in the nearby half moon wood. Definitely reccomend. We spent a wonderful week at cove cottage with my grown up sons their partners and 2 dogs. Everyone enjoyed the stunning position and recharged some well worn batteries. For me the view from my bedroom window of the ever changing sea colours, and the sound of the waves on the rocks was truly enchanting.The only downside was we had to leave. We had a great time in this clean and cosy cottage. The host is very friendly and helpful. Everything that's needed for a perfect holiday was there. Very nice secluded quiet location with beautiful views to the sea. Friendly welcome. Nice hosts. Clean accommodation. This is our second visit to this fabulous house. It must be in one of the best locations in Morgan Porth. We have had the best time with all our family ( 6 ) adults and 2 dog's. Two weeks unbroken sunshine it was just heaven. On entering Hope Cottage it immediately said welcome in, what more can you ask for and with milk, tea, coffee and biscuits it was job done and the holiday starts now. The reason we only gave good for location is because I have to use a mobility scooter and things were a bit difficult at times (perhaps a little ramp from the back gate inside would help) but it did not spoil our holiday. there are many places to visit nearby, all in all a good time was had by all. We loved this cottage and its location. Very comfortable and warm. Excellent kitchen, great shower - set in a great village with fantastic pub (can't recommend highly enough!) and a really super village shop. The car parking is challenging! We would definitely book again! Lambs Barton Cottage was a unique property in an ideal location and a lovely place for my partner and I to spend a week in Cornwall. We would highly recommend this cottage. Didn’t have any curtain for roof glass. So, we couldn’t sleep properly. Other than everything is good, clean, tidy and very spacious. I recommend this. lovely welcome with fresh flowers,a pint of milk in the fridge. Couldnt have wished for a better place to stay. Clean,comfortable and spacious. Location for us was great for the purpose of our holiday.Highly recommended. The cottage was really homely and very comfortable to stay in. Good location to stay in to walk the dogs. Very clean and tidy. Everything you could need. Cosy feel to the house. Slow your cooking down but improve the flavours by cooking on the Aga. Log burner one of the best I’ve used. Very near the A39 which gives access to the coast north and south. Good places to eat out in Bude or the seaside towns. Local pubs a bit limiting though. Good venue for larger family. Lots of board games and some dvds around the house. Lots of help and information from the very friendly owner. Felt good experience and value for money overall. Stayed at Post Box Cottages for a few years now because it is handy for us to visit South and West Cornwall. The cottage is always clean and comfortable and with two bathrooms is handy when four or five people are staying. No problems with heating in cold weather and plenty of hot water. Some dvd's available and plenty of games to use if weather is too bad to venture out. Happy to recommend this property. Lovely place to stay in St Mawes. Clean and beautiful with a short 5 min walk to the shops/pubs....although a steep hill. Couldn't work out if you could override the heating system but the log burner did the job very well. Would definitely recommend. Comfortable, had all that was needed - except (strangely enough) tea towels and an oven mitt, but I think that was an oversight. Beautiful location. Enjoyed it very much. An excellent holiday let with great views from the kitchen and sitting room. Plenty of room for a family or a group of friends. Was a little disappointed on second stay that there were only 2 sets of towels provided although we paid for whole property. Kitchen could do with a few more basics (dishes, plates etc) but otherwise excellent and would definitely recommend. We had a lovely week at Trewince. It is the most idyllic place. Wonderful views and beautiful beaches. The lodge was well equipped and comfortable but some updating is needed. When you're paying around £1200 for a week you expect everything to be in great condition but it wasn't. I also think it's a bit mean not to provide towels (not even a tea towel). I wouldn't mind any of this if it wasn't so expensive. It is a welcoming and homely place to stay and, due to the wonderful location I would consider returning. The place was ideal location for us, just a short walk to the beach for the dog to enjoy himself. The cottage had everything that was required, but if you have a dog there is no grass in the garden so its little jollies out but if was fine for us. Plenty of walks to enjoy. It was a lovely place for us to escape. Our journey was excellent despite awful weather. But it did not depend on the owner. Very clean and very comfortable. Many thanks. Just looking for somewhere pleasant for the family to get away from it all, relax, and enjoy life for a week - and this more than fitted the bill. Owners were pleasant and very helpful, the cottage was wonderful. Thoroughly enjoyed our stay, exactly what we needed. The peace and solitude wouldn't be to everyone's taste, but suited us just fine - exactly what we wanted. Within an easy drive of several great things to do and see, but then to return to the cottage and just chill. A wonderful oasis in Cornwall. The hosts, Pat, Dave and Julie were marvellous and exuded Cornwall friendliness. Nothing was any trouble. The studio is exceptionally well equipped with modern conveniences and facilities. The home-baked scones and cream tea were tasty and much appreciated. Very good location for visiting the north coast of Cornwall. Definitely a lovely little studio, perfect for a couple, in a quiet country location. We loved it a lot at Trevennen cottage. It is a peaceful an beautiful place and very lovely furnished. Just perfect for relaxing family holidays. Also Flushing is a very lovely and authentic village. Perfect spot to explore Cornwall. We would definitely come back. Thank you Veryan for letting us stay here. We booked Waterside for an early Spring break and the minute we walked through the door we knew we'd made the right choice. If we hadn't wanted to explore the area I think we could have easily spent all week in the lovely lounge looking out on all the activities in the Marina and the lovely views. The house is very spacious and extremely well equipped with everything we needed. It was a 20 minute walk into the centre of Falmouth and location-wise well placed for driving around the area. Private gated parking was also appreciated. We'd certainly recommend this property. Le cottage est propre, fonctionnel et cosy. Sa situation est exceptionnelle: vous poussez le portillon et vous êtes sur le sentier qui mène à la sublime plage Holywell bay et à ses dunes magnigiques. Pendant 3 jours nous avons tout fait à pied, les sentiers sont biens balisés et agréables. On a adoré. Pas de réseau dans la maison mais il y a une salle commune avec du wifi (et billard) et en marchant 1 min vers la plage vous retrouvez le réseau. Mais ça fait du bien d'oublier son portable et de profiter. Location de matériel de surf à 500m à pied. The accommodation was very basic and could do with a revamp. I actually found it depressing. A bit like staying at your nan's but not in a good way. Just returned from 10 days in this lovely cottage, it did not take us long to settle in. Kitchen very well equiped, lounge comfortable, double bedroom very spacious. Everything as described, garage across the way with parking, not a problem. Location was particularly good for us with walking from the door, bus to St. Mawes or Truro, good shop and cafe down the road in Portscatho. Easy walk to the sea, also ferry from St Mawes to Falmouth, The Hidden Hut not far away and The King Harry Ferry 15 mins drive away. We hope to be back next year, it is perfect for visiting the family in Portscatho. This is a spacious and well apointed cottage in a superb location. Quiet isolated spot with unspoilt views of the bay below, yet just a short drive to shops/attractions etc. Corner Cottage is located above, and has a lovely long view towards, the water. It is peaceful in the sunny patio at the front of the house and the cottage itself is comfortable (and during a chilly April visit, well heated), properly equipped and quite charming. We thoroughly enjoyed our stay at Acorns, as did our dogs Jess and Archie, comfortable and cosy! Lovely to have a garden that was dog proof! Love the cottage having stayed in it before. Great location and comfortable but did this time felt it was a little tired and in need of refreshing. Some light bulbs hadn’t been replaced and the crockery especially mugs and glasses are rather old and limited. Remains a lovely place to stay but perhaps time to undertake some limited upgrading/decorating. We only live 20minutes away from the cottage, it felt like we were miles Way from home. Amazing set up and we all had a fab time. Facilities for the children were brilliant and the dog loved it too. Thank you for a fab stay. We were a group of 6 and had the most perfect stay at Riverside. Plenty of space, comfortable beds and perfect location. No one wanted to leave! Lewinnick Lofge a short walk, perfect sunset venue for dinner and drinks. We went 4 times. We would like to return! Perfect location for the beach with the wonderful surf and coastal walks. We had one dog and a baby with us too and everything worked for them as well! Lovely large rooms and the hot tub was a big hit! Brilliant stay in Pelyn, comfortable,spotless with all you need for a great holiday. View wonderful, river, boats, sunrise and quiet. Lovely owners. St Mawes and Falmouth to visit and the Roseland to explore. What more could you want! Excellent long weekend and just right for our family party of 10. The kitchen / dining facilities were equipped with the right quantity of everything to comfortably cater for a large group. Our only small frustration was the lack of oven space - a double oven would be useful. Hopefully we will get the chance to return soon. Under the bed was not cleaned The location is near a busy road The 2 chairs that can be turned into 2 beds are have thin matrasses. Fortunately Andy provided us with 2 extra. The pool was good and warm. The kitchen was very good with 2 free washing machines The toilets and bathrooms were clean. An excellent cottage, warm and comfortable, which was an ideal place to stay to experience the delights of a beautiful coastline, stunning spring gardens and friendly people. Excellent little find for us for a fantastic week away. Fantastic hosts,great location, dog friendly. Shower is best we have ever had away from home. Our little dog loved the 3 acres of gardens. Would go back anytime. Thank you for a fantastic week. Very comfortable property. Milk, tea etc welcoming. Cold when we stayed so loved the wood burner in the evenings. The cottage was located in the heart of St Mawes and had stunning views from the lounge and main bedroom. The cottage was very comfortable and well equipped. The housekeeper had left us a delightful welcome card and fresh flowers. A very special place to stay. Would definately go back. The location was quiet and a short drive from the beach. The cottage was Perfect, very well equipped, homey and very clean. Lovely little cottage perfect for a get away weekend for two. Great views of the working harbour and an excellent location for visits to nearby Charlestown where filming for Poldark takes place and also the Eden project. Lovely cosy little cottage, with everything we needed. Wonderful scones and clotted cream on arrival. Yum! Great to be able to take the dog. This was a great property to stay at, and far more spacious then it looks on the outside. Our kids loved crabbing next to the ferry, a minute away from the property. Both pubs were great too. Comfortable cottage in a great location. Slept well every night so the bed must've been fine. No major issues but bunk beds are a bit wobbly and there was no grill for the grill pan which was a bit odd. The property exceeded our expectations and was a lovely welcome after a long drive. We had an amazing time in St Mawes and made many happy memories. Wiggy's was a lovely home to come back to. We'd certainly rent it again. We were a family of 5 and it was our first visit to St Mawes. The accommodation at the Watch House (top floor) was perfect for us. Great views of the bay, ideal position in town, nothing is more than a stone's throw away. The facilities in The Watch House were all we needed. Great to have a utility to store beach things and also wash&dry clothes. The town itself is charming, good food and drink options and plenty to do around and about, will certainly visit again. We had a brilliant holiday at this beautiful cottage in a fantastic location. Francis was really helpful and the cottage was well-equipped with everything that we needed. I can honestly say that we were all (that's all 9 of us!) impressed with the house and its position in St Mawes. The set up is fantastic, especially as we had dogs with us. Downstairs was perfect for the canines - and the view from upstairs - amazing. Apart from the first night (when we walked 10min to nearest pub!) we actually cooked/ate our main meals 'in' as the kitchen is well equipped and easy for our 'chef of the day' to still feel part of the group as the rooms are so well arranged. Wouldn't hesitate to book again for the next celebration. Gorgeous sea views from the house. Walking distance to the harbour and the near beach, Porthcurnick. Lovely peaceful cottage, well equipped kitchen with plenty of crockery for the 7 of us that stayed. Lovely and clean too. Would definitely go again. This is a great cottage- comfortable, well equipped with great sea views. It is well located with easy access to the village and the coastal paths. Neat compact cottage - well located for all attractions in Penwith. Clean and tidy. Would stay again. This is our 2nd visit to this cottage. While being close to the coast it has a quite and private location which we appreciate. It is well appointed,comfortable and offers everything we want for a short break. The owners are friendly and nothing is too much,yet your privacy is never encroached on. Can’t wait for our next visit. We have stayed at Aalsmeer many times and enjoy our visits and holidays there, the cottage has all you need and more, the location has a panoramic view of Widemouth Bay to the South and North. The cottage is appx 400mtrs from the beach, Black Rock beach area is always dog friendly which is a bonus to this location. The cottage was nicely decorated with some lovely crafty touches like bunting mostly with a sea theme in cool blues and whites. Location was in a tiny hamlet which was very peaceful but for people with young children it was a car ride to beaches. We loved it and enjoyed discovering the little coves and local pubs suggested by the helpful owner. We would like to go again. My one slight criticism was that the bathroom was in need of an upgrade with poorly functioning bath and shower taps. Still a very pleasant place to stay. First time in Wadebridge. Greeted by the lovely owner Jenny on arrival, toured the cottage and made to feel very welcome. Gorgeous cottage and cosy. Ideal location for visiting the local areas of Padstow, Rock and the north coast. This was a lovely cosy cottage within walking distance of Camelford. We used it as a base to visit Padstow, Tintagel, Rock and Wadebridge. The property was very well equiped and has a lovely shower room and a separate bathroom. We came down to Cornwall on 29th September until 6th October 2018 and stayed at Number One in St Mawes. We found the apartment very comfortable and it felt like home to home! On arrival the tea and biscuits were very welcoming after our journey there. The location of the apartment was perfect, as we were only 30 seconds from the harbour! We thoroughly enjoyed our stay and we hope to come again next year. Stayed in this locality so we could visit our daughter at Falmouth university. Bonus that it was dog friendly with space for dogs to walk out in the field. Kitchen was well equipped. All rooms clean and tidy with equipment to clean where necessary. Would recommend this cottage . It was very good holiday ever here in UK. With so much to see . The swimming pool and Jacuzzi and the cottage were more than perfect for family. Excellent views very comfortable helpful and accommodating for my elderly fathers oxygen and medical equipment. Quiet area nice walks some local places to visit some driving involved to travel to other places and larger supermarkets. Overall would recommend and hope to stay again next year. All that I was expecting and more!All that I was expecting and more!All that I was expecting and more!All that I was expecting and more! Our stay was very comfortable, and everything was to a very high standard. Can’t speak highly enough of The Linhay . Thank you! Beautiful cottage. We arrived and it was a chilly afternoon but the cottage was warm thanks to the cosy heater in the sitting room being put on for us. Super comfy beds with crisp white linen and soft pillows made for a great nights sleep. The kitchen is one of the best stocked I’ve seen, everything anyone could need. The neighbours popped in and were lovely, really friendly. The only negative I found and it’s not anything the owners can be responsible for, was the traffic noise and proximity to a very busy road. We enjoyed a wonderful 5 nights in this delightful cottage and our two labradors enjoyed there many walks on the surrounding beaches . The cottage is well equipped and close to Wadebridge . We stayed for 3 nights at Coppers, and really enjoyed the house. It was clean, nicely decorated and warm. Everything we needed was there. The views out over the harbour are lovely, and the short 2 minute walk down into the harbour, shops, bars and cafe's was no problem. My only recommendation is that you get a new mattress for the master bedroom. It was not the most comfy mattress I have slept on, but apart from that, we loved the place and would definitely stay there again. Perfect for our family and dog. Lovely location -rural which is what we are used to - large garden and lake for us to play - short walk to the beach and coast walks in both directions with stunning views. House well equipped. Host extremely helpful. We enjoyed our stay at Chupra. Everything made for a good holiday. We did find the hot water ran out quickly when we all needed showers. We've stayed here several times and love the location right on the beach. The cottage is comfortable and warm just showing signs of wear and tear, nothing to serious which couldn't be sorted with a couple of days work and a few hundred pounds of investment. Our family of 5 had a great week at New Quay House. We swam and Kayaked straight from the steps in the garden and really enjoyed the views from many of the rooms (almost felt as if we were in the captain's quarters of a grand ship at times). We had a lovely stay in the quiet harbour of Portloe the location is beautiful. Only comment would be that we were dissaponted not to find any basic provisions for a self catering cottage eg. Tea coffee or even salt pepper and no extra loo roll !! The property was very comfortable, well equipped and in an interesting location. The walks along the coastal path and inland were amazing with fantastic scenery, sightings of kestrels, buntings, whimbrels, oyster catchers and seals. The historical sites such as the castles at St. Mawes and Pendennis, plus the churches were fascinating plus the more recent sites connected with WWII.. If in need of retail therapy Truro was worth a visit with more historical places to visit. An area of Cornwall which is well worth a visit which suits a variety of interests. We stayed in Mariners Cottage for 4 nights and it was perfect for our needs. Mylor Bridge is a beautiful little village, with the house just over the road from a play park and fantastic village shop. The house was itself lovely - cosy rooms and easy to look after, with everything you might need in terms of crockery and cutlery. And Rob was always responsive and very helpful. In summary, we really enjoyed our stay - thanks very much for having us! A visit to my parents who live in Bude so had seen The Nook many times not realising it was available to rent. Location couldn't be better, ideal for a dog (if the sheep aren't around). Furnishings a bit dated and beds uncomfortable. All the amenities you need - the wifi was fine during our stay. Might be helpful to fill in the massive pothole outside the gates, could do some serious damage to a car! It was adequately cleaned but we feel it was overpriced due to the holiday cottage feeling worn out. List of things that didn't work below French doors didn't lock at all, water pressure (Sink/Bathroom) very low and no hot water till 11pm at night?. No mobile or TV Coverage at all for the whole week of our stay. Kind of Drainage smell in the bathroom, either the bath or sink, came and went during our stay. Young Couple arguing nights next door in Number 17 about money till 1.15am at night. Finally no clocks at all in the property. No light in the fridge working. We felt the accommadation, although comfortable, was a bit overpriced. It would have been nice to have a television in at least one of the bedrooms, so that when people wanted to watch different programmes, they could do so. Lots of space, indoors and out. Quirky and interesting old farmhouse, with gothic touches! Failed to make enough use of the sizeable sitting room due to the attractions of the kitchen with its lovely warm Aga. I have stayed in Mizpah several times and am always happy to go back. The views across to Falmouth are wonderful and there are excellent walks right on the doorstep. It's a comfortable cottage - more spacious that some of a similar period, and I especially like the deep window seats. Well equipped, although it never seems to have a corkscrew so I take my own! Very nice flat and as it looks in the photos. Patio not very nice for sitting out as mentioned by other reviewers, but we did not require this. 300yards to the beach, probably as the seagulls fly. Property is high up and not for those with walking difficulties. we had an enjoyable and comfortable stay. Seagrass is located just steps from Gearran's Bay with excellent views from the living room window. Every day was a different view of the waves and tides. The condo was spacious and very clean. I would definitely stay there again. A lovely courtyard surrounded by picturesque barns. Very comfortable and clean. The pool was an excellent bonus. We had a really enjoyable stay. Our stay at Pennine was comfortable and the surroundings area was idyllic and peaceful but we found we were quite isolated from local restaurants and supermarkets.The New inn pub was close by but opening hours were very limited. The cottage had everything you need for a comfortable stay but my only disappointment was the couch in the lounge ,it needs updating as it was difficult to relax.I also struggle to see how maybe a family of 4 could sit adequately in the lounge area. In saying that the beds were very comfortable and the shower was excellent. It is lovely there my only complaint is that it was discribed as luxury . It is lovely but not luxury. Apart from that it was lovely cosy and comfortable I would recommend it ..games room was awful . Some aspects need tlc . But all in all good . Great place, great cottage. Many thanks. Loads of extra items left for your connivence, short drive to Bodmin. The sitting room and bedrooms were excellent. The bathrooms and kitchen would benefit from some TLC. Overall we enjoyed our stay. Loved it.home from home.beautiful view could do with brighter light in bedroom.could do with new suite.other then that perfect. This is a great house in a fantastic location with lots of bathrooms and an amazing garden. Very warm as it has an ever hot in the kitchen, well equipped and lots of sitting areas, beautiful views of the sea and St Mawes, we would love to stay again. Only criticism would be the shower which isn’t very powerful, other than that it’s a great place to stay. We wanted to stay together with a relative ,self catering and close to Chyprase Farm for a wedding. It suited our purpose very well. The cottage was quite well furnished. The double bed was very good. One of the single beds was poor, the other was just about serviceable. The path down to the cottage was steep, with a lot of moss growing on it, making it slippery. Great care needed when walking down to the cottage in the dark. However, the cottage was very quiet, with no street light pollution, ideal for a relaxing holiday. We’ve stayed at this house several times before and before the prices were raised the location and view made up for the poor condition of the house. We had hoped there would be investment to match the increased price but it was clear Thiabyear that is not the case. The house is tired and unloved and in need of updating and adding a few quality and comfort touches. It is functional but in poor repair. Compare this cost with similar properties and the value does not stand up. It’s a real shame as the location and view are top quality. Stayed for 4 nights. Cottage was as advertised and it was lovely to find milk, scones jam and cream provided to welcome us in. It made a good base for our stay but was a little off the beaten track. A good spring clean would bring the cottage fully up to scratch and I would recommend this be done ready for the start of the 2019 season. Fantastic cottage a stones throw from the harbour and superb pub. We ate in the evening by the waters edge as we carried our dinner the 30 seconds walk to get there! Clean and perfect for our family of four. A little tired around the edges and one tiny shower/toilet but perfectly adequate for what we needed. Value for money was high and would recommend for anyone that wanted location at an affordable price. A comfortable and well appointed cottage, with just a few snagging issues. Window to single back room needs fixing. Light over cooker needs to be replaced. Cottage wasn’t very clean, attention to hob and oven!